Come to F&R, the experts for all your direct mail needs. 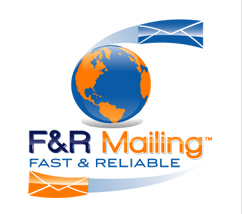 When you choose F&R Mailing Services Inc., you choose the best. For almost 40 years, F&R Mailing Services Inc. has been a leader in handling direct mail campaigns. We are a full service letter shop, focused on providing fast and reliable service to customers throughout the United States. We are a family-owned business located just outside Chicago, in Westmont, Illinois, and proudly serve the bustling and fast-growing counties of Cook, DuPage, Kane and Will. Using the latest technology, we strive to be fast, getting many projects out in two days of receiving your material—sooner if it’s a rush job. We respect your deadline, but don’t sacrifice quality of service. Whether you are an individual or a large corporation, our friendly staff is ready to handle your bulk mail projects of many shapes and sizes. At F&R we do all the preparing of your mail pieces so you don’t have to spend valuable time on that task. Our services also include list purges, database corrections, and we’ll help you qualify for postal discounts. We have the know-how and we’ll put our knowledge to work for you. Are you trying to decide which of the many various options will work best for your direct mail campaign? F&R Mailing Services Inc. will be happy to help you decide. Let us do the work for you and take the guesswork out of your decisions. Take advantage of our discount offers. We can give you excellent bulk mailing rates. With us, you are not hindered by the size of your project. We understand that you are seeking reasonable mailing costs for your campaign, regardless of size. We specialize in a range of volumes, from as few as 750 direct mail pieces, to many millions of pieces of mail. Talk to us about your plans. F&R understands what you need for your direct mail campaign. We also understand the workings of the United States Postal Service and the other mail delivery services as well. The U.S. Postal Service has a range of prices for direct mail pieces, including different rates for various classes of mail, such as for non-profit and standard mail (advertising mail). We will find the most economical way for you to proceed. F&R will help get your project moving in the right direction. We will find out where your customers are today, not where they were four or five years ago; they might have moved. We will speed your project forward in a timely fashion, using updated mailing lists and address corrections. We use only the best and most suitable methods for your particular mailing needs, whether brochures, statements, letters, invoices, flats, postcards or self-mailers. You will benefit from our expertise, when you select F&R Mailing. You can rely on us. Call us today for details. We will give you a fast response. We will help you be a winner and stay out in front. Read more on our website about what we have to offer. Find out everything you need to know about conducting a winning direct mail campaign and learn what we can do for your business or organization. Because of our dedication to excellence, our customers come back to us again and again. Your mail matters, and we will not only help you get ahead, we will work to keep you ahead of your competition. © 2001-2017 F&R Mailing. All Rights Reserved.